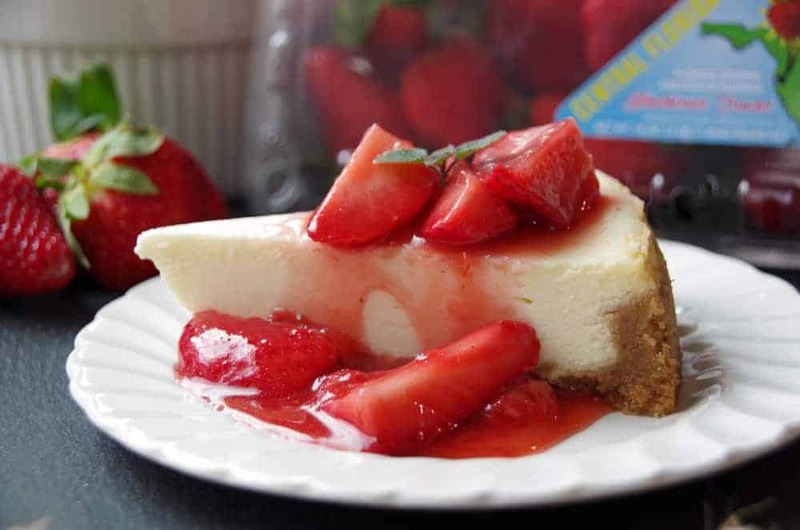 You are here: Home / Recipes / Fresh Strawberry Topping Recipe for Cheesecake, Ice cream and More! 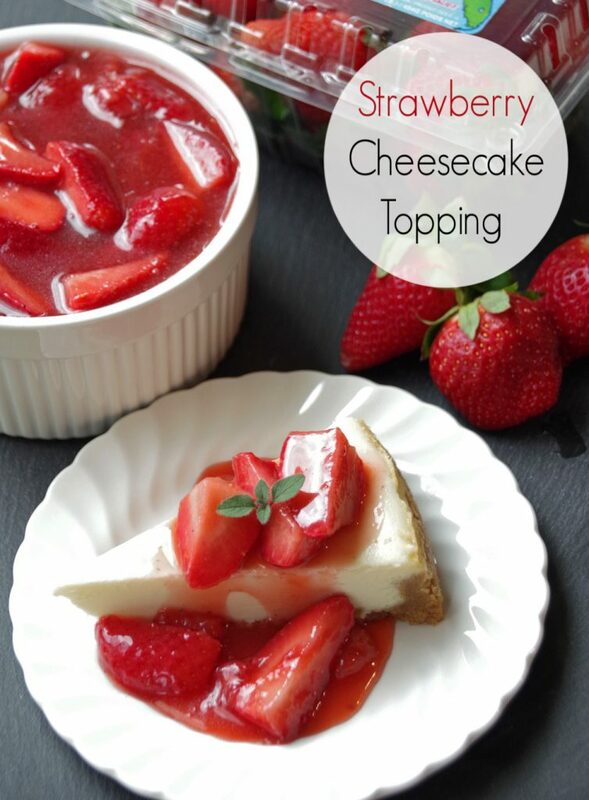 Fresh Strawberry Topping Recipe for Cheesecake, Ice cream and More! This fresh strawberry topping recipe was sponsored by Fresh From Florida as part of an Influencer Activation for Influence Central. All opinions expressed are my own. As crazy as it sounds, here in Georgia, I am already seeing signs of spring. There are daffodils starting to bloom and the weather some days is already in the 60’s. The south warms up quickly in the spring. As a result, we start seeing Florida produce in our grocery stores by early February. On my last trip, I found Florida strawberries (both organic AND conventionally grown) and decided to make a fresh strawberry topping recipe for cheesecake this weekend. 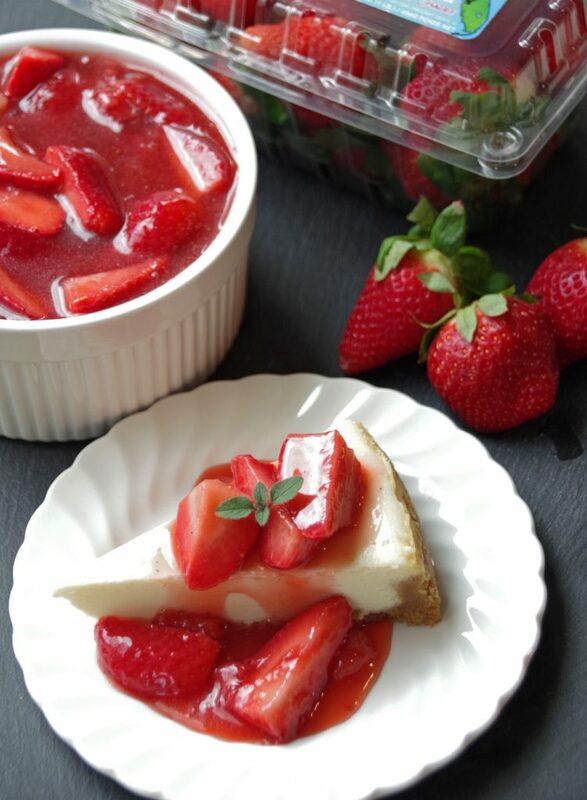 There is nothing more delicious than a fresh strawberry sauce poured over creamy cheesecake! Use on breakfast foods like pancakes, waffles, or crepes. Or make breakfast for dinner! Choose Fresh From Florida Strawberries! Choosing US grown produce is incredibly important to me. While it can be challenging sometimes during the winter, living close to Florida has it’s benefits! Take a minute or two and look at where your food is coming from. Buy US grown when possible and look for the Fresh From Florida label if you want some of the best strawberries around! Florida farmers make it easy for everyone to eat fresh produce year-round. I found mine in our local Sprouts grocery store but often see them in other major retailers as well. Check out the Fresh From Florida website for more delicious strawberry recipes. 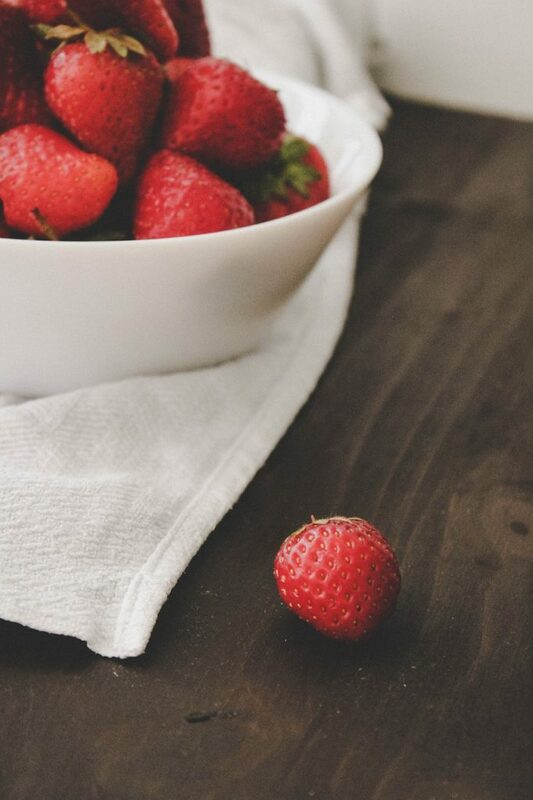 Store fresh strawberries in a colander in the refrigerator. This allows the cold air to circulate around them. Do not cover them. Remove caps from strawberries only after washing (the caps keep the water from breaking down the texture and flavor inside the strawberries). Avoid storing them in the refrigerator’s crisper section. The increased humidity speeds up the growth of mold on strawberries. 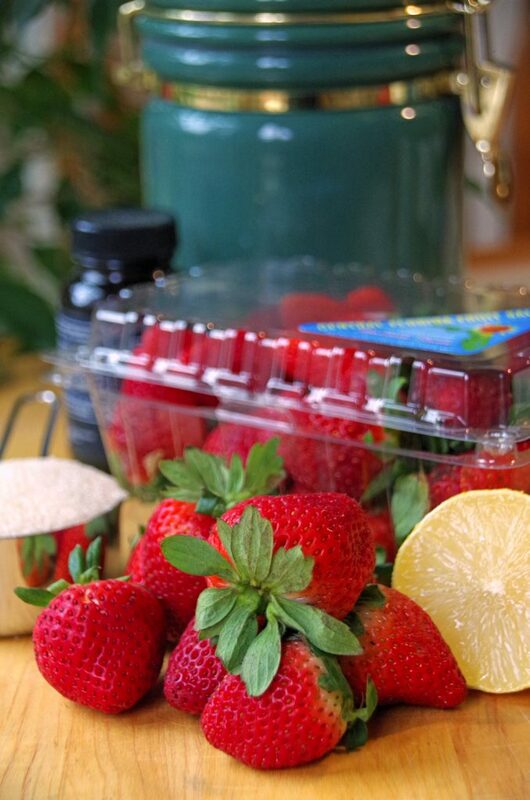 When you are ready to use your fresh strawberries, just remove the cap, rinse in cold water, and slice. There are a few things that make this fresh strawberry topping recipe a step above all the rest. Fresh lemon juice helps bring out the bright flavors of the Florida strawberries. I chose to use vanilla bean paste rather than plain vanilla extract because it has such a nice bold, flavor. And adding a couple tablespoons of butter right at the end gives the strawberry glaze a rich mouth feel. There is seriously nothing as delicious as strawberries for cheesecake toppings! And making this strawberry dessert topping with simple ingredients like Florida strawberries and real cane sugar makes the flavor and color really stand out. I highly encourage you to head out and find some Florida strawberries. Then, whip up a batch of this fresh strawberry topping recipe and indulge yourself! Love strawberries? Make a fresh strawberry topping recipe! There is nothing more delicious than fresh strawberry sauce on creamy cheesecake! In a large saucepan, combine 3 cups quartered strawberries, water, and sugar. Bring to a boil and reduce heat slightly. Add lemon juice and vanilla. Stir. Combine corn starch and water in small bowl. Stir til smooth. 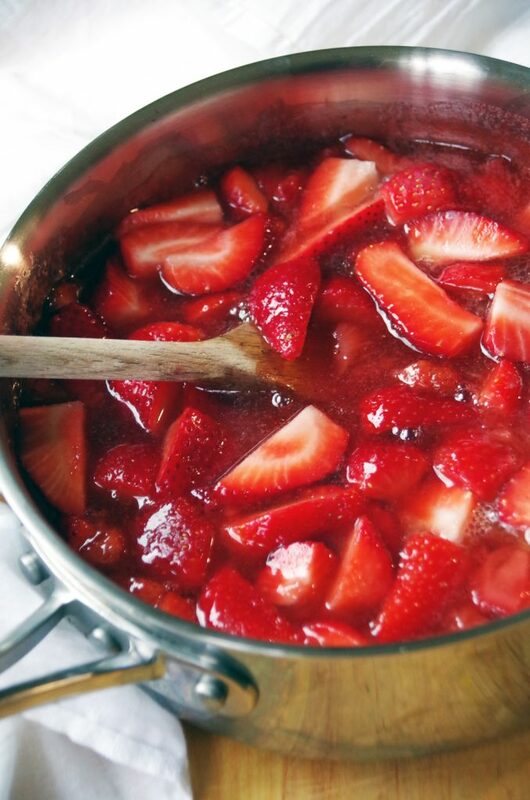 Drizzle into simmering strawberry sauce. Stir 3 to 4 minutes until slightly thickened. Add in remaining quartered strawberries and stir. Serve over cheesecake, ice cream, pancakes, etc.